Samsung hopes to maintain its "lead by following" style of innovation for this year's Galaxy S7 launch by copying the Live Photos feature Apple developed for iPhone 6s, but the planned feature may not be done in time for the flagship's launch. After consumers yawned at Samsung's wraparound "Edge" screen last year, the company released a Rose Gold lookalike finish just like Apple's, days before the launch of iPhone 6s. Reaffirming its conviction that its own ideas are not very good and Apple's are better, Samsung is planning to replicate Live Photos, as best as it can, according to a rumor by Android Geeks. Called "Vivid Photo," or alternatively "Timeless Photo," the feature copies the idea of Live Photos, but leaves out audio capture and outputs a GIF image that users can share. There are a variety of third party apps that already capture low quality animations as a GIF file (a format which doesn't support audio, but is widely supported in chatrooms and various sites on the web, requiring no new third party support). Live Photos capture is a hardware feature unique to iPhone 6s and 6s Plus, supported by iOS 9. By default, it automatically records contextual motion & ambient sound when a full quality photo is taken. In the background, this video is paired to the still photo when it is saved in the user's Photos Library. Once captured, Live Photos can be shared with other iOS 9 users via iMessage or iCloud Photo Sharing, or via an increasing number of social networks that are adding support the new format. That includes Tumbr, Facebook and Instagram. Because it is a new format, other platforms must take some minor efforts to support it. iOS 9 and Apple Watch can both use Live Photos as Lock Screen wallpapers. Apple also has added Live Photos support for Messages on Macs in the latest beta of OS X 10.11.4. Earlier iOS devices running iOS 9 can play Live Photos with a finger press; iPhone 6s models invoke the feature with 3D Touch. Sending Live Photos to a platform that doesn't support it converts the image into a standard still image. Prior to releasing Live Photos, Apple supported Burst Capture, which rapidly takes a series of photos as long as the shutter is held. The problem with this approach is that it can result in hundreds of duplicative photos that the user has to decide whether to keep or throw away. Apple enhanced Burst Capture to automatically select and recommend the best photos using face recognition and focus analysis. Other vendors also support some style of Burst Capture, which is largely based on the hardware capabilities of the camera sensor, not a novel implementation of image capture or presentation the way Live Photos is. HTC earlier released smartphones with a "Zoe" capture mode, which allows users to take a snapshot, hold for a burst, or continue holding to capture video. Animated burst sequences or video clips can then be processed into a composite image (similar to double exposure) or edited to remove objects. Zoe doesn't result in a photo that comes to life when touched like Live Photo. That didn't stop Android Geeks from claiming that "HTC's Zoe Capture was capable of doing the same thing long before Live Photos," and complaining that "this gimmick only became cool now because Apple has it on its phones." Samsung is also reportedly working to deliver a pressure sensitive display with similarities to 3D Touch. However, Apple stressed at the release of iPhone 6s that implementing 3D Touch feature was far more complex and difficult than simply adding pressure sensitive screen hardware. iPhone 6s models sport bendable glass developed through a partnership with Corning, and use 96 sensors embedded in the LCD's backlight that register each flex as a function of distance. Accelerometers are used to cancel out the effects of gravity whether a person is walking or laying down. Small vibrations from Apple's Taptic Engine are used to confirm when a press is successful. There is nothing special about how the short video and still image work. I would have hoped Apple would've positioned it as more than just an Apple feature, but something everyone should adopt. It would be nice to use just basic HTML tags to create that neat effect that you see in "Harry Potter" posters and newspapers. Without widespread adoption, I think this will become just another gimmick feature that users don't really care about; and that's not something Apple does very often, at least not in comparison to their competitors. Um. HTC Zoe, anyone? I know it's hard to believe but some things do exist before Apple "invents" them. why would apple want to spend resources pushing for a new feature on competing devices? LP works with iphones, ipads and macs, and thats a huge audience already (all my family is iOS, etc). as an example, iMessages is iOS-only, and really is a value-add to apple's ecosystem, considering the best-in-class security iMessages enjoy. You're asking why Apple would want anything they created to ever be open source or standardized? You'll have to Apple why they've decided to have such a long track record of doing just that. i was thinking the same thing. and it's all been said about samsung. I think all of this is funny as hell. Who cares if Aplle did not invent it? They perfected it into something consumers will actually use no different than the original pc. Who cares if Samsung copies everything? It just shows their true character and nobody who wants the best will buy their products anyway. Why didn't Apple patent the hell out of this? That way they could sue SameDung again. 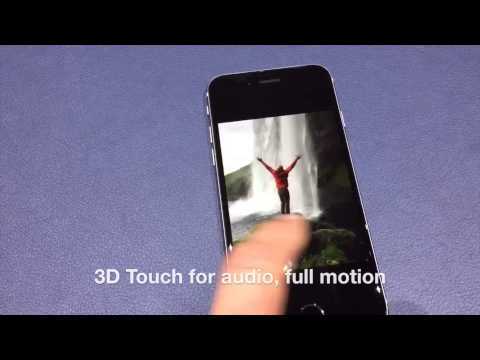 The tech behind 3D Touch is really impressive IMO. Understanding what's a press and what's a bend or other unintentional cause for the sensor to get a reading is not easy at all. Once again pretty cool engineering totally under the hood while the user simply enjoys a new feature. Personally, while not yet upgraded beyond a 6, I can't count the occasions where I watched a nice pic and wished I had a snippet of sound or motion to convey the atmosphere in a more intense way than the pic would do. I'm talking about nice snapshots here. If there is anything to patent, it would be easily worked around. It's a video of 1.5 seconds @ 15fps encoded with H.264 with an MPEG4 container, and a 12MPx image (since that's the 6S series takes) paired with it. What exactly would be patentable? The worst thing to happen is to have this be limited to just Apple devices, and then another vendor having their own options that nearly the same by slightly different, and then websites wanting to adopt them but having to deal with it like we're living in the 90's when IE6 was king. Better to just have a standard that makes for a better user experience for everyone. Nokia living photos is another example of an idea that does basically the same thing. In this case, Apple is the follower, and samesung is just really following. Didn't the s4 have animated photos? The reason Apple didn't patent this is perhaps they want this to be something that acquires wider appeal. Also, they can watch and laugh as Samsung tries to copy it in some craptastic way. Then to add insult to injury, they'll make it a standard in WebKit that Samsung's craptastic implemantation won't work with and we can watch and laugh while they pedal some more. If you can't do it yourself than imitate. People will say you Samsung copycat, no-shame,bla bla but you can male money. Nothing wrong for Samsung. Nothing new. Stay crappy, Samesung. This whole copying thing is getting way out of hand. They're just phones.